What is Qi (or Chi) and how does is it affect my Dog’s Health? Qi, (pronunced Chee) in Traditional Chinese Medicine describes your Energy or Life Force. The Chinese Character “Qi” depicts cloudy vapors, like steam rising off of rice. The ancient Chinese gave the name Qi to recognize that something as alive. Jing is in 2 forms: prenatal Jing and postnatal Jing. Prenatal Jing is an animal’s health at the beginning of life. It is most similar to our DNA and genetics, it encompasses our likelihood toward disease or imbalance. Newborn mammals continue to get Jing from colostrum and their mother’s milk, which is why this neonatal time period is so important to the health of all babies. Prenatal Jing is stored in the kidneys. If the animal is born with inadequate Jing, they have congenital issues. These Jing deficient animals are the runt of the litter or develop “fading puppy or kitten syndrome” at 2 or 3 weeks old. Postnatal Jing is also called Acquired Jing. It is derived from our Gu Qi, which is the food we take in. This is why the food we eat is so important. We know what we eat matters in people. By eating healthy foods, we prevent disease. If we eat poorly, we are setting ourselves up for chronic diseases and obesity that can affect our life and well-being. The same is true for our dogs. This is why our dogs’ diets must be improved. Processed, poor quality ingredients are not only allowed in the dog food industry, they make up the entirety of nutrition. Chinese Medicine understands that, just as in human nutrition, a good diet is the best way to prevent disease such as cancer and chronic inflammatory conditions we see in our dogs. It is the only way we can nourish our Jing and strengthen our Qi. The Shen is translated as both our spirit as well as our mind. When the Shen is healthy, we have inner peace. This is expressed in dogs by normal behavior. Shen disturbances manifest as behavioral problems, separation anxiety and dementia. The Shen remains healthy when there is balance in the body. Chinese Medicine supports the Shen with Whole Food Nutrition and daily exercise. The old saying “a good dog is a tired dog” is true because it is exercise that breaks up blocked Qi flow. The mental frustration young dogs feel is best relieved with physical movement. Senior dogs can experience dementia and insomnia because of internal deficiencies that progress as they age. We can support these senior patients and make their golden years so much richer with cooked, real foods. For example, feeding Cooling foods such as turkey, barley, broccoli and cauliflower can help an older dog rest and feel more settled. 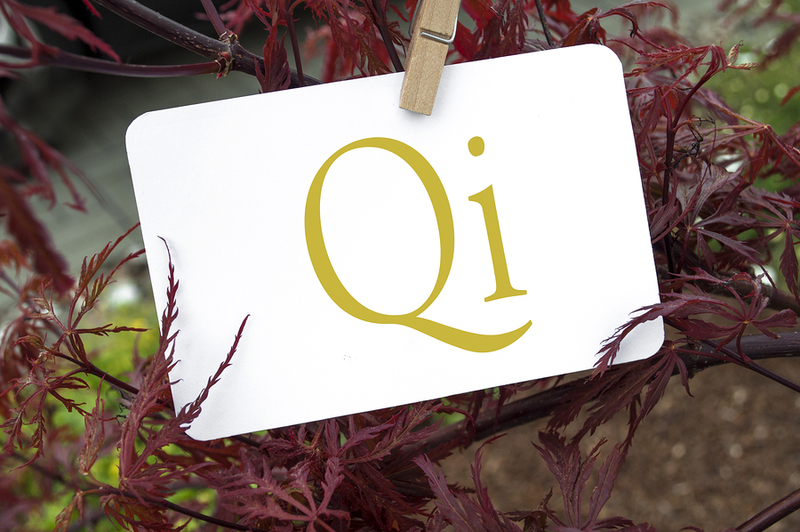 Qi is your life force. In young children and puppies, Qi is abundant. As we age, if we have good nutrition and health, we replenish our post-natal Jing with healthy food, (Gu Qi) and our Qi remains strong. When we pass away from old age our Jing is depleted and the result is our Qi is deficient and finally, cannot move. In Chinese Medicine the amount of Jing we have we have, determines the length of our candle wick, or our life expectancy. When our Jing is gone, our Qi cannot move, and we pass away. This I why what we eat is so important, nutrition fortifies or drains our post-natal Jing. When chronic diseases and cancers occur in younger, healthy animals, they are caused by imbalances or blockages in our bodies. If they are not managed or cured, eventually it will drain our Qi and lead to an early death. The way we increase or protect our post-natal Jing and Qi and thus prevent or mitigate disease is through good nutrition and exercise. Good nutrition in Chinese Medicine is a balance of Whole Foods. A colorful mix of foods indicates varying nutrients. These nutrients strengthen our Qi and keep us balanced. When we are healthy, we eat to maintain this balance. When we have disease, we eat to restore the balance. This is how Chinese Medicine uses food as Medicine, both to prevent and treat. Processed foods, (such as dog kibble) do not strengthen our Qi but drain our Qi. This is true for us as well as our dogs. Human nutrition knows processed foods are not an adequate diet, Western Medicine is just beginning to embrace this truth in dogs. Chinese Medicine has understood that food can be powerful medicine for 3,000 years. Some foods are used herbal medications, such as dried Goji berry used to treat eye dryness in some herbal medications. Eating whole foods to specifically balance your body’s tendencies based on your Element can further strengthen your Qi. To find out your dog’s elements, take our short quiz here or to learn more about the elements, visit our Elements page here. Here’s to your dog’s health!